This article takes into consideration only the effects of a nuclear EMP, not a solar flare. A solar flare would only affect any electronics connected to the grid. #1. Will a microwave work as a Faraday cage? #2. Will a refrigerator work as a Faraday cage? No, most refrigerators do not work as a Faraday cage. I tested mine, and it’s definitely not a Faraday cage. #3. If I keep a backup mobile phone in my Faraday cage, will it work when I need it? Yes, your phone will work perfectly. However, it will be rendered almost useless because the network will not be functional. The only form of communication after an EMP will be the radio. #4. Do I need to store batteries in a Faraday cage? No. They will continue to work regardless and will just take up space in your Faraday cage. Here are the best batteries for survival situations. #5. Do Faraday cages need grounding? #6. Do I need to keep my solar panels in a Faraday cage? No. The only part of the system you have to worry about is your solar panel inverter. Don’t worry about your solar panels; they will be fine. It’s best to buy an extra inverter and keep it in your Faraday cage so you can replace the useless one after the EMP. #7. If I wrap electronic devices in heavy duty aluminum foil, will that work? No. But if you wrap the cardboard box in which you bought them in heavy duty aluminum foil, this would be an effective Faraday cage. #8. Will flashlights continue to function after an EMP Strike? Some flashlights will continue to function, and some will burn out. It all depends on the power and distance from the blast. #9. Is a shipping container a Faraday cage? Yes, but just remember that you can’t just put the electronic devices directly in contact with the metal. Some people board the interior of the container with wooden panels. #10. Can I use this shipping container as a “Faraday garage” for my car? Yes, you can definitely do that. Most cars fit in a standard shipping container, but just to make sure, go ahead and take the measurements before buying a shipping container. #11. If you turn off your devices, will they be EMP-proof? #12. Are airplanes Faraday cages? No. Planes operate on the basic principles of lift and thrust, so they will become more or less gliders. They will be very difficult to control and most of them will fall from the sky and crash. #13. How do I test an object to see if it will work as a Faraday cage? You can test any device that you think might work as a Faraday cage with a radio. Simply turn on the radio and place it inside the device. If the radio is still receiving a signal, then it’s not a Faraday cage. If you don’t have a radio, you can use a mobile phone, but the results won’t be 100% accurate in the sense that if your mobile phone still rings, then it’s definitely not a Faraday cage, but if it does not, you can’t really be sure. You need to test it with a radio to be 100% sure you have a Faraday cage. #14. Can you EMP-proof a car? You could build a Faraday cage, but this would mean that you will either never use your car or will need to buy a new one. I’ve seen some pictures online of people wrapping them in aluminum, but as I said previously, it’s pointless. Instead of making your car EMP-proof, I think you would be better off buying an old, cheap car that has an electric system that is a lot less vulnerable. 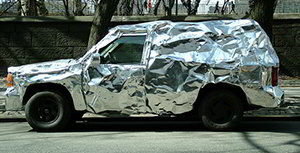 Here are the top 6 EMP proof vehicles. #15. Will a galvanized steel trash can make a good Faraday cage? Yes, but the can has to close perfectly, and you will have to line the walls with cardboard.